It always happens. I tell someone we're harvesting or I have a pick in the morning and they say, "have fun!" Harvest is many things: inspiring, rewarding, fulfilling, exciting, meaningful, exhausting, but it one thing it isn't is fun. At least not if it’s your life and your living. It may be fun to work a harvest or chip in for a few days, but if you have to take that fruit, make wine, bottle it and sell it fun is not part of the equation. Harvest is the worst thing and the best thing that happens to you every year if you want to make wine that means something. Making great wine is not fun, it's an obsession. Most of all it is intensely rewarding, not financially, but somehow, spiritually. The mental and physical exhaustion that is harvest is what wells up inside of you when someone asks you about how many points your wine received from some critic, but then you remind yourself it's a lot easier to make opinions than it is to make wine. It's hard to describe the intensity that we focus on our wines. The hours and hours of walking the vineyards and agonizing over every little choice that is made in the sometimes years long path a wine takes from the flowering in spring until it has the Cornerstone Cellars label applied to its bottle. The experience of each harvest may not be fun, but the memory of it most certainly is as each moment comes back to life with every cork you pull of that vintage for years to come. Yesterday at daybreak it was cloudy, cool and showers were threatening. Today more of the same. Finally it feels like harvest in Oregon. It was ninety degrees just a couple of days ago and the crew was working in shorts and t-shirts instead of the usual fleece and flannel garb usually associated with Oregon harvests. The weather we started harvest in was a reflection of the entire growing season in the Willamette Valley. It was hot. The hottest ever. The Oregon wines from this harvest will reflect that, just as they should. After all, isn’t the point of growing pinot is letting the idiosyncrasies of each harvest and vineyard speak for themselves? What are the results of this warm Oregon vintage? It means that the grapes are being harvested at brix levels that are considered high in Oregon, but low in the Russian River Valley. In other words they will be big pinots by Oregon standards, but not those of California. What I think they will be are rich, charming wines that will be ready to drink, and should be drunk, young. This is the way nature should work with some vintages better for drinking young and others needing time to reveal their true character. Their rich textures and softer acids will mean a lot of wines getting big points from certain critics. Just remember, sometimes the closer the score is to 100 points the more the likelihood that you should drink the wine young. Yesterday we were very lucky as our fruit, from the Saffron Fields Vineyard in Yamhill Carlton, arrived at the winery early in the morning allowing us to get a quick start on processing fourteen tons of pinot noir. This is really the maximum amount of fruit the team can physically handle. I assure you your arms and legs are tired after hand-sorting that much fruit. Doing it day after day gradually wears you down and getting out of bed in the morning becomes a creaky, sore process. The day finished with a quick tour of the vineyards remaining to be picked to get samples and determine when they’ll be harvested. There will be a break of a few days now as rain comes through the area. The remaining vineyards just need a little more time to fully develop their flavors. Today I’m heading back to the Napa Valley as we’re picking Oakville Station Cabernet Franc at the crack of dawn tomorrow. After that harvest we’ll be sampling our cabernet sauvignon vineyards (that’s all that remains in Napa) to set the dates for their picks. It seems clear at this point that everything will be picked by the end of September. Crazy, simply crazy. It’s 6:30 in the morning and it’s time pick the grapes. However there is no picking crew waiting except us. This vineyard was going to be harvested by the four of us. This is the Maverick Vineyard, in the Oregon Willamette Valley sub-AVA of Yamhill Carlton. It’s just a baby and an infant like Maverick does not produce enough fruit to interest a crew of pickers paid by the bucket. The fruit needed to be picked so the four of us picked it. 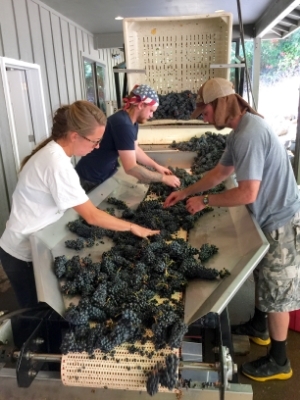 Then to the winery where over the next twelve hours seven of us hand sorted and processed 15 tons of pinot noir, from our other vineyards, which are now happily cold soaking as we finish cleaning up the mess that only handling ton after ton of grapes can make. An interesting thing happens after you hand sort that much fruit. The tartaric acid crystallizes on your fingernails making them look like they’ve been painted white. I don’t think it’s good look for me. You’ll excuse me after fifteen hours of hard work for not being more eloquent, but I’ll give you a more detailed look at our Cornerstone Oregon harvest tomorrow. Good night as another fifteen tons will be waiting in the morning. It was almost cold at 6:30 a.m. when dawn started to break and I considered heading back to my truck to get a jacket. But by 9 a.m. it was already hot. Winemaker Kari Auringer and I were out to sample the fruit in all of our Napa Valley vineyards and to start to pick harvest dates. By 2 p.m as we finished it was pushing 100 degrees. Some wine regions worry about rain and hail. In the Napa Valley this year we are worried about the heat. It has always been my belief that the problem vintages in the Napa Valley are the hot ones, not the cool ones. This has been a odd year, as they all seem to be these days. We started with a very early bud break due to the warm, nonexistent, winter, which was followed by a cool, damp spell at flowering. This meant an uneven fruit set and a lot of unripe bunches needed to be dropped before veraison completed. This, of course, means a smaller crop for us this vintage. Fortunately, what’s left looks great. Summer itself was mild by Napa Valley standards, but as we approach harvest a serious heat wave is upon us. The results of our vineyard tour is setting things in motion for what is sure to be a hectic vintage that could even be over before the end of September. Crazy. This Friday we will be bringing in merlot from two vineyards and cabernet franc from another. The Oakville Station Cabernet Franc should follow the middle of next week and cabernet sauvignon looks to be about two weeks out, but who knows with this heat. This late season heat spike is forecasted to be over by Saturday so our remaining sites will be able to finish ripening in a more civilized environment. Just what we like, letting them coast over the finish line. Saturday I’m headed up to Oregon to start our chardonnay and pinot noir harvest. Strange as it seems, up to now, Oregon has had more days over 90 degrees than the Napa Valley. Things seem a bit upside down when it comes to the climate these days. I’ll update you on Oregon this weekend.